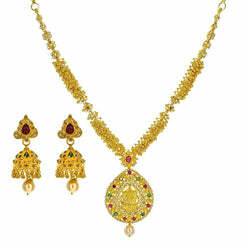 22K Yellow Gold Choker & Jhumki Drop Earrings Set W/ Ruby, Emerald, Kundan & Deep Carved Mango Detail for women. 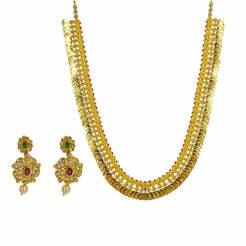 This standout choker necklace and jhumki drop earrings set is embellished with rubies, emeralds and kundan with a deep carved mango detail on an antique finished frame. The necklace is 15" long with a width range of 2-125 mm. Its pendant is 20 mm long and 15 mm wide. Each earring 32 mm long 17 mm wide. 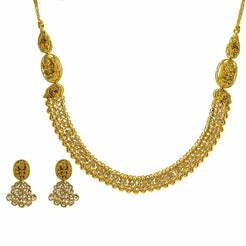 This exquisite set weighs a total of 106 grams.